The history of modern China cannot be fully understood without examining the dynamic cultural, political, and economic interactions between China and Japan over the last two centuries. A leading scholar of modern Asian studies, Prof. Joshua Fogel's research focuses on this interaction, the importance of Japan in China's modern development and the changing attitudes of China towards Japan (and vice-versa) from the fourteenth through to the nineteenth century. As Canadian Research Chair in the History of Modern China at York University, Fogel will examine modern China through a pan-Asian lens. 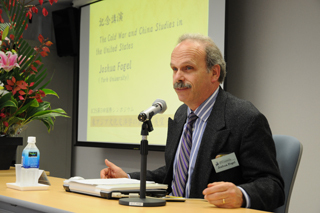 As part of this research, Fogel is writing two books on China-Japan relations centred in Shanghai during the nineteenth century. One of these books examines the first modern Japanese mission to China in 1862. Fogel will also study the first modern Japanese community in Shanghai, from its inception in the 1860s until the first Sino-Japanese War of 1894-95. He will address such questions as: What characterized Japanese society in Shanghai and what types of institutions did these Japanese expatriates create there? Finally, he will investigate the importance of translators and how they mediated all interactions, especially between Chinese traders and Japanese merchants at the port of Nagasaki. Fogel's appointment is in York's Faculty of Arts' Department of History. His research will be enhanced by a connection with the York Centre for Asian Research (YCAR), which provides an interdisciplinary focus for the study of Asia, drawing together the research of many prominent scholars. Graduate and undergraduate students will also benefit from advanced projects under Fogel's direction.